It’s been a busy time, but I thought I’d write up a short update. I am less than 10 days away from putting the last touches on the manuscript for Drug War Capitalism before it goes to the printer. Right now myself and the lovely folks at AK Press are in the excruciatingly tedious and yet crucially important proofing stage. The book will be printed by November, and I’ll do the first launch at the Howard Zinn Memorial Bookfair in San Francisco. After that I plan to tour with the book on the west coast, in December I’ll visit the east coast, and in January, Arizona and south Texas. If you have tips or ideas for the tour you can email me at (all together) dawn paley at gmail dot com. On top of finishing the book and so on I also recently started a PhD program in Mexico, during which I plan to work on a second book that deals with clandestine mass graves and exhumation in Mexico from 2007 to present. But more on that another time! I did this review recently for Upside Down World. Todd Miller. Border Patrol Nation: Dispatches from the Front Lines of Homeland Security. City Lights Books, 2013. These are wild times to be a border cop. They have big salaries, new toys, and all kinds of powers to roam the country racially profiling people, and detaining those without proof that they crossed the border legally. An increasing number of agents are returned combat vets who fought in Afghanistan or Iraq, who bring warlike attitudes to their work in the U.S. But this (mostly) boy’s club is not without its drawbacks: it is also a place permeated by a culture of militaristic racism where having a different opinion can get you blacklisted. 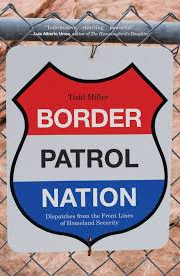 Border Patrol Nation, Todd Miller’s first book, is an in-depth look at how border enforcement has expanded drastically following 9-11. Since then, he reports, the government has spent $791 billion on Homeland Security, the agency responsible for border control. Miller convincingly argues that the expanding phenomenon of militarized border control is something that should concern all of us. He reports that in 2012, “The $18 billion spent on border and immigration enforcement outdoes all other federal law enforcement bodies combined including the FBI, Secret Service, Drug Enforcement Administration, U.S. Marshal Service, and the Bureau of Alcohol, Tobacco, Firearms and Explosives.” The money is also flowing outside of the U.S., to agents and client states in order to tighten their borders and prevent migration north. Most of the reporting I did on the recent trip I took to Colombia will be appearing in my forthcoming book, Drug War Capitalism, but here’s a second, short piece from Arauca Department, near the border with Venezuela. Published in Upside Down World. 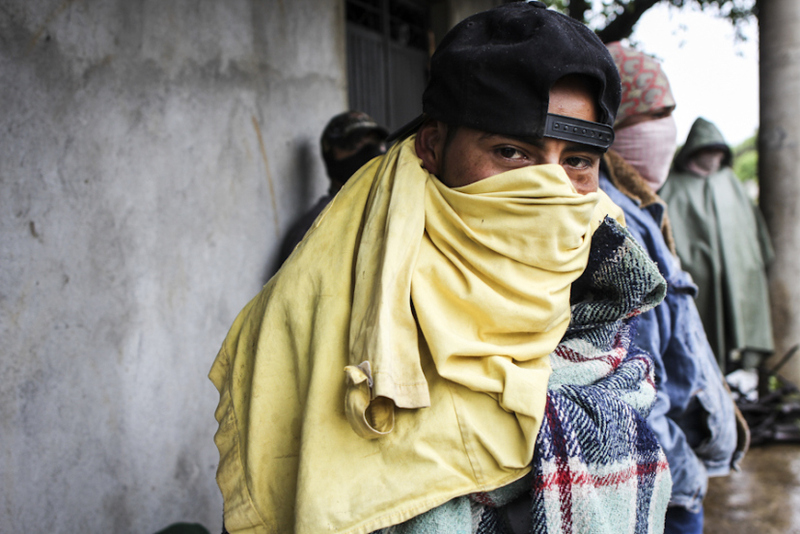 FORTUL, COLOMBIA–Holding down an occupation for five months isn’t easy. Doing so in Colombia, even less so. But members of the community of Héctor Alirio Martínez in the municipality of Fortul, near the border with Venezuela, have raised the stakes even higher: they’re occupying land owned by the Ministry of Defense. The 100 hectare terrain now spotted with wood and plastic homes was slated to become a large military base. Community Members at the Occupation in Fortul, photo by Dawn Paley. Locals say the land originally was purchased by Occidental Petroleum in order to build a large new base to coordinate protection of a new oil pipeline which passes less than a few hundred meters from the lot. “This land belongs to the Ministry of Defense, it was purchased and sponsored by Oxy, so we as good people from Arauca said that the most viable thing is to take over this plan, and see if the Minister of Defense will give it to us over time, many people needed this land,” said Jhon Carlos Ariza Aguilar, the Vice-President of the community of over 2,000 families. They began the occupation on November 26, 2013. Hello friends. For the record, my thoughts on events in Venezuela. Published by The Tyee. As the political situation continues to simmer in Venezuela, Canada has been making quiet gestures of support towards the country’s opposition movement. Since February, the Venezuelan right has taken to the streets, attempting to undermine the democratically elected socialist government. The street demonstrations came while an initiative of economic sabotage against the government was underway, including the hoarding and smuggling of basic foodstuffs and a smear campaign in local media. Voices of reason warn that the media is failing to report the truth about the recent eruption of protests in Venezuela. But Ottawa has actively pointed a finger at the government of Nicolás Maduro, expressing alarm at state violence and defending the right to legitimate protest. Such declarations are eyebrow-raising, considering how Canada treats left-wing opposition movements that employ similar (though far tamer) street tactics than the Venezuelan right. Think back to the mass arrests at the Toronto G-20, or ongoing sweeps of demonstrators under the P-6 law in Montréal. A short piece for The Dominion on Canada’s uptick in arms sales to Mexico. MEXICO CITY—The beginning of 2014 marked the 20th anniversary of the Zapatista uprising in Mexico, but instead of focusing on the ongoing revolutionary work of Indigenous people and their allies in the south of the country, the eyes of Canadians and people around the world were on the state of Michoacán. In mid-January, thousands of federal troops and police entered the Tierra Caliente region of Michoacán and stormed smaller villages, in an attempt to disarm self-defence groups. Local and global media carried striking images of federal forces confronting local people who displayed a variety of weapons, dressed in mismatched shirts, their faces covered with kerchiefs or swatches of fabric. 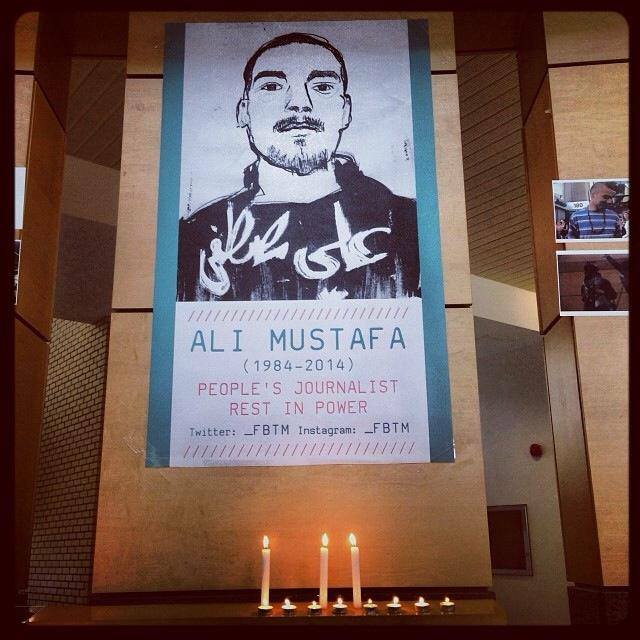 On Sunday, March 9, I learned of the death of Ali Mustafa, a friend and colleague. He was killed in Syria by a bomb dropped by the Assad regime, along with at least seven others. I met Ali at the G-20 in Toronto in 2010, and we kept in touch now and then as he tried to make his way in the difficult world of freelance journalism. Before he was killed he sold photos to some major outlets, taking huge risks in order to make some coin and get a foothold. But he was also in Syria because the suffering there was something he felt he needed to expose. Please take the time to have a look at Ali’s work at his blog, From Beyond the Margins. There aren’t that many Canadian freelancers out there in the world who consistently file for independent media. I consider myself one of them, and Ali was another. His death has rocked our small, under resourced, and sometimes fragmented community. I hope that it will lead us to further organize so that we can continue to produce critical journalism from places where being a writer or a photographer is a risky affair. We really do need to take better care of each other. RIP Ali. You will be remembered always, and you will be deeply missed. This is the first of a couple short pieces from my recent visit to Arauca, Colombia. I was mostly gathering material for the book but wanted to get a few articles out meantime. This piece was originally posted on Upside Down World and re-posted by Truth Out. FORTUL, COLOMBIA — On Saturday, November 23rd, Giovanny Yamid Aldana left his humble family home in a rural area in the municipality of Fortul, to take his pregnant wife and son to the clinic. There, she took an ultrasound test, and the young family stayed over night in the city of Saravena, in the department of Arauca, near Colombia’s border with Venezuela. Giovanny Yamid Aldana holds a photo of his home, destroyed during a bombing by the Colombian Air Force on November 24, 2013. Photo by Dawn Paley. The next morning, Aldana got a call from a local authority, informing him that his house had been bombed by the Colombian Air Force. 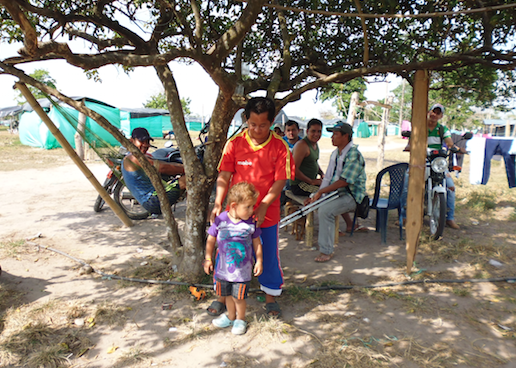 One of Aldana’s farmhands was reported dead, and the other injured. 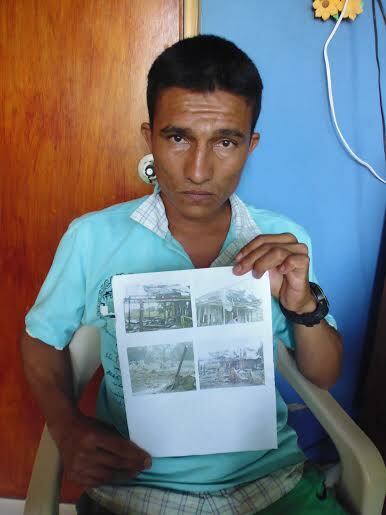 Aldana took a single, letter sized piece of paper out of his bag, which had four grainy photos printed on it, showing the charred remains of the house he had lived in for the past year, growing bananas, yuca and other vegetables in order to support his family. The army reported that nine members of the guerrilla were reported dead in the bombing, and two others were captured. “The Army stated that it was a guerrilla camp, but the owner of the house, Giovanni, who was dedicated to farming, and that’s where they bombed. Yes there were combatants, but there was also civilians there,” said Aide Cristancho, a human rights official with the local government who provides assistance to victims of the armed conflict in the municipality of Fortul. Here’s a piece I reported from Honduras for my friends at Toward Freedom. 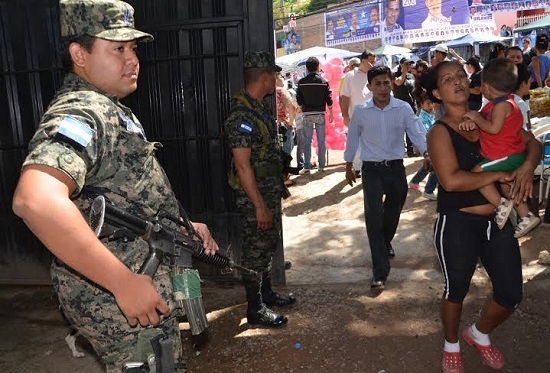 TEGUCIGALPA—Election day in Tegucigalpa kicked off on November 24th last year with the feel of a carnival, a rare sensation in a city where the vast majority of residents are faced with grinding poverty, regular gang extortion and a murder rate that is among the world’s highest. In front of each voting station, tents from the various political parties provided shade, blaring music at each other from huge speakers as groups of youth and volunteers hung around. Police, army and masked military police oversaw the crowds. Cars honked and people waved Honduran and political party flags as their vehicles crawled through the fray. But for Marta de Jesus Raudales Varela, who lives in a small house on a steep unpaved street, it was a heart-wrenching day. In January, her son Ángel Francisco Durón Raudales, an activist with the leftwing LIBRE Party was murdered along with five others around the corner from the family home in the Las Ayestas neighborhood. “[The killers] told them to lie face down, so they lay face down, and they emptied their pockets so that they could pretend it was a robbery. [The killers] had their faces covered, but everyone could see what happened,” said Raudales. The killers shot all six in the back and in the head as they lay with their faces to the sidewalk. Two days after the massacre, street gangs posted signs and handed out pamphlets warning residents they were imposing a 7pm curfew. Almost a year after the massacre, no one dares to mention gang involvement in the killings for fear of reprisals. A tough-as-nails grandmother, Raudales Varela was robbed at gunpoint four times in a single year while she walked home from selling lottery tickets a few blocks from her house. She cried quietly during our interview, wiping her eyes with her apron. Aquí la traducción de un articulo que escribi por Occupied London el año pasado. Para ver más fotos, visita la página de SubVersiones. Por Dawn Paley. Traducción: Nicolás Olucha Sánchez. Fotografías: Heriberto Paredes. En 2010 y en 2011 varias granadas de mano explotaron en los ayuntamientos de Reynosa, Matamoros, Nuevo Laredo y Ciudad Victoria, cuatro localidades fronterizas mexicanas en el estado de Tamaulipas. Se señaló al crimen organizado como autor de las explosiones, concretamente a miembros de los Zetas o del Cártel del Golfo. Visité la zona a comienzos de 2011, intentando averiguar qué podría estar conduciendo a grupos de delincuentes a enfrentarse a los gobiernos locales que, a efectos, están bajo su control. Las piezas no comenzaron a encajar hasta que conocí a Francisco Chavira Martínez en 2011. La primera vez que quedamos propuso que fuéramos a comer a un restaurante de Reynosa conocido por sus huéspedes de altos vuelos. Camareros con esmoquin a lo pingüino iban y venían con bandejas mientras las demás mesas estaban, en su mayoría, ocupadas por hombres mayores. Chavira hablaba en voz alta y sin miedo. Entrevisté al menos a doce personas más, pero Chavira fue el único de todos los entrevistados que permitió que su nombre real fuera utilizado. Los gobiernos locales “utilizan lo que es los roba-carros para todo aquel que esta en contra de ellos, les mandan a robar su carro, los ladrones de casa, los ladrones domiciliarios que le llaman, entran a robar tu casa para espantarte, los narcotraficantes, que los utilizan ellos como una forma de que la gente tenga miedo, para que no participes, para que no alces la voz, para que no estés en contra del gobierno, incluso se mandan ellos mismos a tirar granadas a las presidencias municipales”, relató Chavira. Quizá vio mi incredulidad reflejada en el rostro. Todavía no había captado la mecánica del terror y los intereses a los que sirve. “¿Por qué?” Se preguntó a sí mismo, para hacer una pausa acto seguido. “Para que la gente se asuste y no vaya a exigir a la presidencia, ni exijas transparencia de las cuentas publicas, en qué se gastan el dinero, por que si no, si lo hago, me van a matar, me van a meter una granada.” Meses después de nuestra entrevista, Chavira, candidato del Partido Revolucionario Democrático (RPD), presuntamente de carácter izquierdista, fue arrestado bajo falsas acusaciones y encarcelado hasta que pasaron las elecciones, un episodio que él describió como un “secuestro legalizado” por parte del Estado. La segunda vez que me reuní con Chavira fue dos años después, en 2013. Nos encontramos casualmente frente a la puerta de la embajada estadounidense en México D. F. en una manifestación organizada por familiares y amigos de migrantes que trabajan en los Estados Unidos sin papeles. Nos dirigimos a una cafetería cercana y le hice una pequeña entrevista. Mientras íbamos de camino se maravillaba de poder caminar tranquilamente por la calle sin miedo, algo impensable en su ciudad de origen. Las palabras que Chavira me brindó en aquel encuentro requieren una pequeña introducción. La versión oficial de la guerra del narco o guerra contra las drogas, la cual, los gobiernos y los medios de comunicación no paran de repetir una y otra vez, es que la guerra que hay en México es entre los malos (los traficantes de drogas) y los buenos (la policía y el ejército, que cuentan con el apoyo de Estados Unidos, Canadá y países de la Unión Europea). Según esta versión de los hechos, los “malos” siguen la siguiente estructura jerárquica: en lo alto de la pirámide están los capos o señores de la droga, luego vienen los generales o jefes de seguridad, los cuales protegen al jefe y sus zonas; después vienen los jefes de plaza, jefes locales que se encargan de una zona fronteriza en particular o de una zona de distribución concreta. Esta versión (que es la principal) es lo que yo llamo el discurso sobre la guerra entre cárteles. Este discurso posee unos rasgos reseñables: confianza casi exclusiva en las fuentes de información gubernamentales y/o estatales, creencia en que todos son culpables hasta que se demuestre lo contrario y que hay víctimas que se ven envueltas en tráfico de drogas y una amplia percepción de que los policías implicados en actividades delictivas son la excepción y no la norma, y que más presencia policial aumenta la seguridad. Here’s a review I did for Upside Down World to kick off the new year. Undoing Border Imperialism, by Harsha Walia, introduction by Andrea Smith. AK Press, 2013. Anyone who has been involved in activism in any of Canada’s largest cities has probably worked with Harsha Walia at some point along the way. An organizing powerhouse who is active across issues and with a lengthy list of groups, Walia is also a writer and regular public speaker. Somehow, amidst a flurry of events and other work, she found the time to grace us with her first book, Undoing Border Imperialism, which came out with Oakland’s AK Press in the fall. In more ways than one, the book is a true manifestation of theory meeting practice, taking strength from Walia’s varied and extensive readings, from her personal life experiences, and from over a decade of movement organizing in Canada. “Undoing border imperialism would mean a freer society for everyone since borders are the nexus of most systems of oppression,” writes Walia. “Rather than conceiving of immigration as a domestic policy issue to be managed by the state, the lens of border imperialism focuses the conversation on the systemic structuring of global displacement and migration through and in collusion with capitalism, colonial empire, state building, and hierarchies of oppression.”Walia carefully outlines her theory of border imperialism, but she doesn’t stop there the way an academic or journalist might. Instead, she dedicates the bulk of the text to reflection and to proposals around what makes for meaningful activism in this context. Undoing Border Imperialism lays out a compelling definition of the concept of border imperialism, and then takes readers through concrete experiences of how it can be challenged and dismantled. 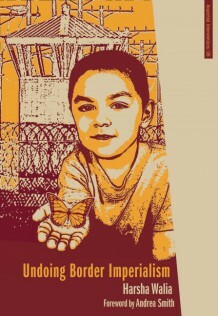 “Border imperialism is a useful analytic framework for organizing migrant justice movements in North America. It takes us away from an analysis that blames and punishes migrants, or one that forces migrants to assimilate and establish their individual worth,” she writes. Vancouver-based Walia plays an ambitious role as both author and curator of Undoing Border Imperialism. She contributes the tight and sometimes dense analysis that builds the concept of border imperialism and grassroots organizing theory. These sections are interspersed by poetry and short stories from primarily women of color writers and activists based in Canada and the United States. Undoing Border Imperialism concludes with a written round table discussion that Walia calls the heart of the book.